One evening when a few of us were drinking hot drinks and swapping trail stories, a retired cop from L.A., who could do an incredible impersonation of Arnold Schwarzenegger and had acquired the trail name “Kindergarten Cop”, asked me what I did away from the trail. So, take your pick: The Rev or The Judge. Maybe you acquired an unfortunate nick name that stuck with you longer than you would have preferred. That is probably true of Thomas and he hasn’t shaken that name in two millennia. You don’t have to be a student of scripture to be familiar with that name. 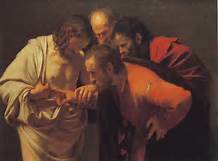 Doubting Thomas has worked it’s way into our culture. You can even look it up in the urban dictionary and find an entry for him. But this is not to deal with doubt, it is rather to consign our faith to ignorance in the search of illusive bliss. “He that never doubted scarce ever well believed,” wrote the poet William Austen. I am not pretending that doubt is a wonderful thing, it is not. It can paralyze us and prevent us from serving God or worshipping him. Yet every servant of God has had doubts, and it might seem that they are indeed a prerequisite for those whose seek to be honest before God. Think of Moses, I cannot do this God, I cannot speak. Think of Jeremiah, struggling with the doubts which characterize the deeply depressed. Think of John the Baptizer, who asked Jesus, “Are you The One or should we wait for another?” Think of Peter who had a life which seemed characterized by dreadful times of doubt, which led him to deny Jesus three times. Yet it is in doubt and the process of dealing with doubts that we grow and mature in our faith. Doubts and faith are twins. The opposite of faith is not doubts; the opposite of faith, is unbelief. All of us have doubts, sooner or later. I like what the late Dallas Willard said, God appreciates our honest questions. They give Him something solid to work with. Honestly, many people today see no point for having faith in God. Only the weak need God, they reason. If they don’t have a weakness (addiction) or a deep and existential longing that keeps them restless and up at night, then they don’t they need God. And because they have no deep longing or need, that must mean that there is no God that could possibly hold them accountable for their life and beliefs. That is a faith claim. That is a belief. That is a leap of faith. For years when I would read that I thought it was a strange response. Here is Jesus showing up for Thomas giving him what he asks for and then shaming him for asking for it. Is it possible that something else is going on here? It may be that what is happening is that Jesus is breaking the Fourth Wall. Do you know what that term means? It is from the theater. When an actor is involved with the dialogue and action of the script, but then at some point he or she turns and addresses the audience directly. This entry was posted in Uncategorized and tagged Doubt, faith, Jesus, skeptic, trust. Bookmark the permalink. Thanks, “Rev”. I appreciate the “4th Wall” explanation with Jesus addressing us.